Armoring Line Overview | Tensor Machinery Ltd. The Armoring line is designed to pay-off, corrugate and form a metal tape around a cable core. The metal tape is typically either steel, aluminum or copper. The Tensor armoring line is designed to apply the metal tape longitudinally around the cable core with a slight overlap as shown in the picture to the right. At the beginning of the armor line we have the tape pay-offs designed to pay off pads of metal tape. Since the tape pads are only a certain length, we supply a tape welder that welds the tape pad ends together to allow for a continuous run. A tape accumulator is used to allow enough time to perform a tape weld. 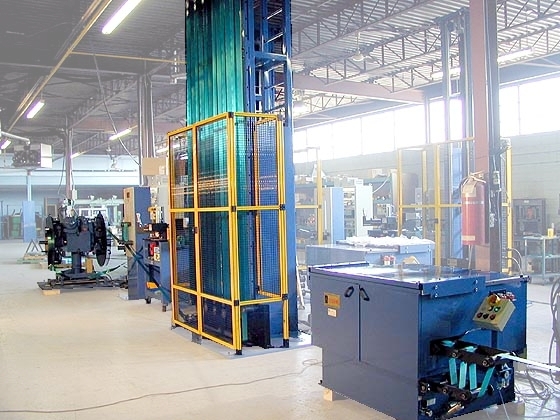 The tape accumulator gives up tape to the line Corrugated Tape Formed around a Cable during a weld and then re-accumulates the tape and waits for the next weld to be performed. In most cases the metal tape is then corrugated before it is applied around the cable core. The corrugated tape allows core flexibility. Finally the tape is formed around the cable core. We typically use Rollformers to provide a smooth and low friction forming of the tape. A Tensor armoring system is normally controlled with a PLC to ensure the proper tape tension control and a smooth accumulation transition during a tape splice. The equipment can be sold as individual components and integrated into an existing Jacketing line. We have a number of configurations and designs for the armoring system that will meet most customer needs. We also have equipment to form smooth aluminum around a cable core.